Frequent readers may recall a previous article: "﻿5 Secrets to Successfully Feeding Your Infant﻿." This time you can learn what NOT to do when bottle feeding a newborn. As a mother to multiple children, as well as a former nanny, I've learned a great deal about babies through experience and research. It is my hope that fellow parents and caregivers can gain from my knowledge. 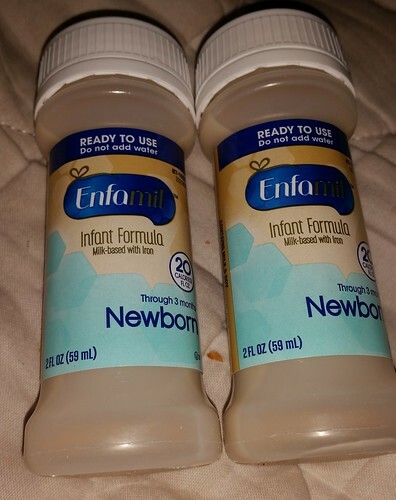 While it may seem harmless to prepare a baby bottle with a little less formula powder or mixture than listed in the directions, it actually can be detrimental to a baby's health. This is one of the most important examples of what not to do when bottle feeding a newborn. Babies need a certain amount of nutrition to be healthy and thrive. Using less mixture can take away some of that nutrition, which can be dangerous for a newborn baby. Only use the measuring scoop that is provided with the formula and follow directions exactly. Not all scoops or formula types measure the same. It is important to pause during feedings to burp a newborn baby. 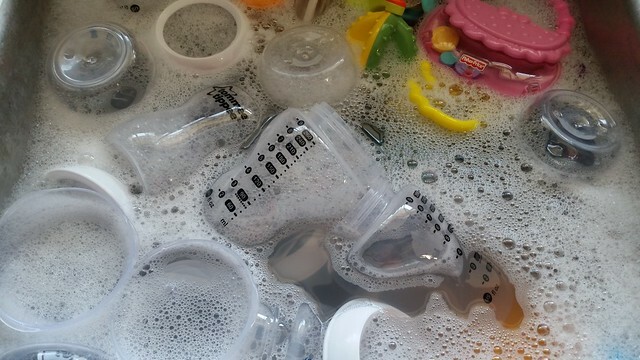 Even with the best designed bottles, air bubbles can still get mixed in with the formula or breastmilk. Just the action of feeding can cause the urge to burp as well. Be sure to burp a newborn frequently during feedings, as well as afterward. Another example of what not to do when bottle feeding a newborn is to lie the baby flat while feeding. When a baby is lying flat, the formula or breastmilk cannot be fed properly. This can cause gas, choking, and other problems. Be sure baby's head and chest are elevated and supported during feeding. 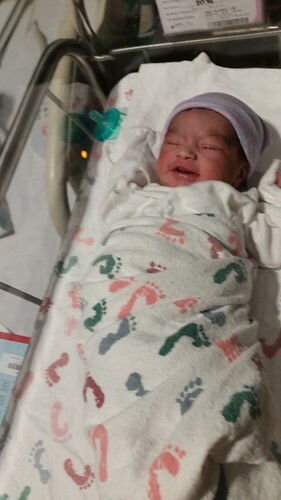 Never use blankets or other items to "prop" up a newborn's bottle. A newborn should be held properly and fed by an adult to ensure that the bottle and the baby both stay in the proper position. 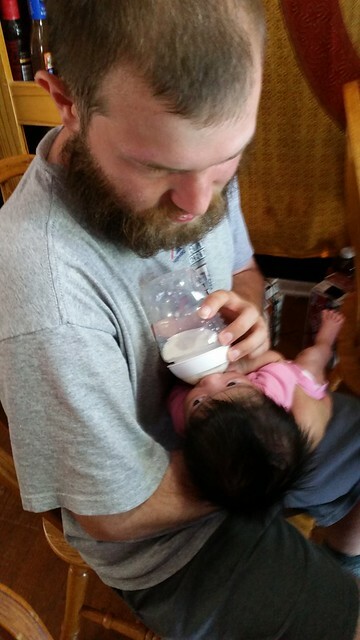 In addition to gas and other health problems that can occur due to propping a baby bottle, a newborn needs the bonding and closeness that comes during feeding time. Just like propping a baby bottle is not safe, neither is placing the baby bottle in a crib or carrier with baby. Even if a baby can grasp a bottle, not only can a newborn not hold a bottle properly, but feeding baby in the crib can cause baby bottle tooth decay. When an infant has constipation, it can cause discomfort, and sometimes pain as well. Giving a baby medications to relieve constipation may not always be a preference or a choice. I have always preferred natural relief over medication when possible, especially when it comes to infants. These all natural ways to relieve constipation that are based on my own experiences as a mother, as well as research I've done over the years. Symptoms and signs of infant constipation may include crankiness, no bowel movements for hours or longer, clenching fists, or small and hard bowel movements. The type of treatment a baby is given will depend on the infant's age. If your baby is under 2 months of age and experiencing constipation, the pediatrician should be consulted on what to do. Some have been known to use corn syrup (or Karo syrup) as an all natural treatment for infants with constipation. According to information found on theMayoClinic website, this is not recommended and may not be safe. Water - This may seem like a logical treatment. However, since infants don't typically drink water, it may not be a first thought. As long as an infant is over 2 months of age, try 2-4 ounces of water once or twice a day somewhere between feedings. Do not replace a feeding with water. Fruit Juice - If water does not seem to relieve infant constipation, another all natural way to try is fruit juice. Just as with the water, offer a baby over 2 months 2-4 ounces once or twice per day, in addition to regular feedings. If a baby will drink it, I've found infant prune juice to work the best. Light Tummy Rub - Gently rubbing an infant's tummy is also an all natural way to relieve infant constipation. Even if it doesn't relieve the constipation, it may calm and soothe the baby. Light Back Rub - If the tummy rub doesn't work, lie the baby on the stomach and gently rub the infant's back. Baby Fruit - If a baby is old enough (at least 4 months) and accustomed to spoon feeding, you might try feeding him or her a baby fruit, such as prunes, peaches, or pears a couple times per day. If these all natural ways to relieve infant constipation do not seem to work, it is best to contact your child's pediatrician for advice. Also, pay attention to your infant and look for other symptoms that may warrant a visit to the doctor. Some of these signs can include vomiting or crankiness that cannot be soothed.